Memorable keynote. Awesome conference. Looking forward to your slides. Thanks, Dave, for doing such a great job highlighting this issue. It’s one of the top issues in my life. Ultimately, I think most health issues are “data issues” — according to my chiropractor, the human body is comprised of 100 trillion cells, each of which is doing about 6 trillion things per second — and each cell instantly knows what the other cell does. That’s a lot of data sharing. 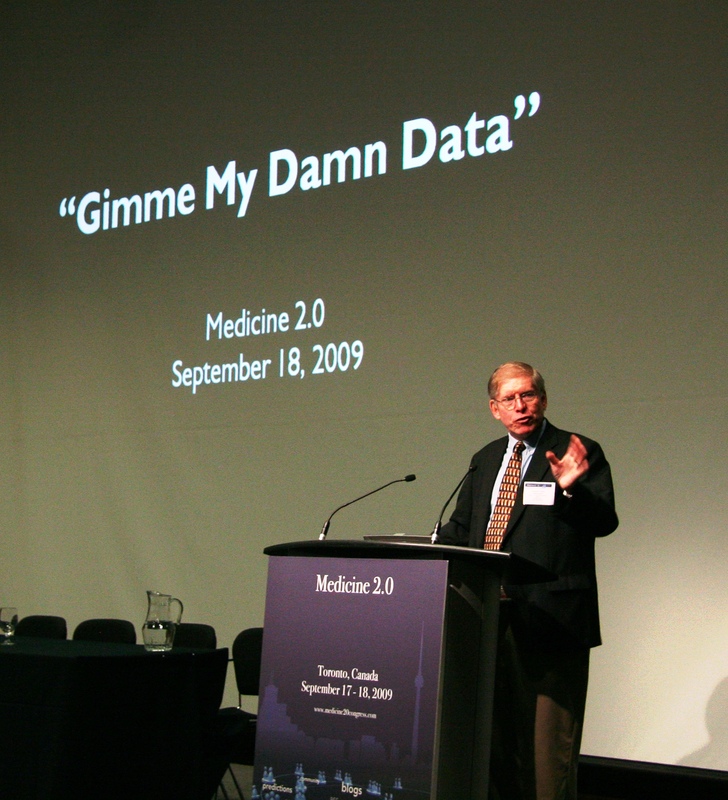 What we do (or do not do) with that data is a key component of health. Certainly, we likely cannot be cognizant of all that cellular activity, but we can do things that make it easier for us to interpret what our bodies are doing and directly or indirectly communicating to us. On a larger scale, what healthcare data we have access to, can literally determine whether we live or die, so I’m not entirely certain why some providers are so determined to wall us off from our data. There’s the culture, of course, and there’s the poorly designed, shoddily implemented, and inadequately supported IT systems that are the vexation of my own doctors. But I think people in power lose the forest for the trees — they forget how much power they have, and they lose sight of the main reason they exist — so that we, their patients, can continue to exist, as well. Personally, having been in the heady malestrom of financial services sector for the past 10 years, and having worked in high tech since the early 1990’s, I cannot for the life of me understand the insufficiency of so much healthcare IT. I work at a company which stewards billions upon billions of dollars, and the controls and processes we have in place safeguard every single cent, every single moment of every single day. We have total accountability to our customers, and if they say “make this easier or I’m leaving” well, we make it easier. No excuses, no shortcuts. We just do it. How much more important is the data of an individual with a serious illness — or any illness, for that matter? — than the dollars in their coffers? It’s a question of priorities. I hear a lot of folks saying the healthcare system is irreparably broken and we can’t fix it. I don’t necessarily agree. Fixing data issues would go a long way towards turning it around. From database design to common syntaxes and data formats to just having systems that are interested in talking to one another… we have plenty of opportunities to improve, and I’d hazard to say we have the resources. After all, we actually do have an abundance of available people who have participated in and help to create a world where accountability for data quality and accessibility isn’t just a wished-for goal, but a fact of everyday life. Consider for a moment — financial services firms have been avidly shedding personnel, and I know for a fact that there is an abundance of highly trained and security/privacy-obsessed top-flight IT talent in the job market today. The same standards that produced financial powerhouses are all but baked into the DNA of a whole lot of job-seekers out there. So from a practical standpoint, there is absolutely no logical reason we should be in this sorry healthcare IT state. It’s vision that’s lacking. And a cultural commitment to attracting, hiring, and retaining top-flight IT talent who make privacy, security, data accessibility, and user experience their mission in life. I’ve experienced it myself — while taking a break from financial services to catch my breath for a few years, I did a 9-month contracting stint with a healthcare provider. Their eventual permanent job offer to me “docked” me 10% of my salary because I didn’t have the exact sort of higher education they required. I left. I wasn’t just an experienced IT professional. Years before most people thought email was worthwhile, I was on the front lines and the leading edge, maturing the technologies that would eventually be turned into curriculae for the kind of education I formally lacked. On a smaller (and much humbler) scale, it was like someone telling a person in Thomas Edison’s lab that they couldn’t get their electrician’s license. I could have helped those healthcare folks a great deal, had I been allowed to, but they were locked into the idea that IT people need to be trained the same way as, say, doctors or hospital administrators. So there was a huge disconnect. I left healthcare and returned to financial services, where results are seen for what they are — valuable results. Ah, I see this comment is running on. I’ll stop now, with the hope that it adds something to the ongoing discussion — one which is utterly critical. It’s truly a matter of life and death. Nice post. I learn something more challenging on different blogs everyday. It’ll at all times be stimulating to learn content from other writers and apply a little something from their store. I’d prefer to make use of some with the content on my weblog whether or not you don’t mind. Natually I’ll provide you with a link on your internet blog. Thanks for sharing. hello and thanks for your info – I have certainly picked up anything brand new from right here. I did however expertise some technical points using this site, since I experienced to reload the site many times previous to I could get it to load properly. I had been wondering if your web host is OK? Not that I’m complaining, but slow loading instances times will sometimes impact your placement in google and could damage your quality score if ads and marketing with Adwords. Anyway I am adding this RSS to my email and could look out for much more of your respective fascinating content. Make sure you update this again very soon..